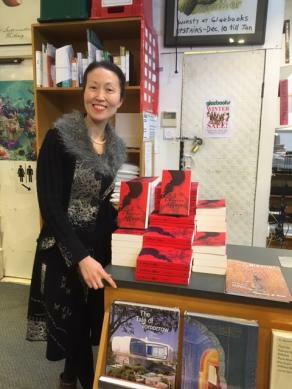 Today is the launch of A Chinese Affair, but more importantly, it’s a gathering of friends: readers and writers, poets and philosophers, artists, musicians and dancers, my teachers, classmates and colleagues. I am so delighted that you join me to celebrate the book. I shall start with my edited thank you list, and then talk a little about how I came to love storytelling. Writing is a lonely life. There’s no shortcut to the long hours, no alternative to solitude. I spend most of my time making a living, and most of the rest of my time writing, or trying to write. So I’m often not there. I thank my friends for not abandoning me. All writers write from somewhere, a place of absence, ambivalence, unease. I dream of writing shapely prose, sentences that fly, words that travel, one good turn after another. But there exists a gap, between the ideal and the reality. Thankfully, I have met the most passionate and selfless teachers who steer me through the otherwise chaotic path of learning. The collection was in fact my Master of Creative Arts thesis. It was completed under the tireless supervision of two distinguished writers: Delia Falconer and Debra Adelaide. My heartfelt thanks for their brilliant insights, candid, astute feedback and wise counsel. I also thank Debra for launching the book today. Debra has been a guiding light for me over many years. To the world she’s a successful novelist; to her students she’s the most patient, down-to-earth teacher. Thank you, Debra. I’m also indebted to Angelo Loukakis. Angelo introduced me to the concept of the short story cycle, and was one of the first to encourage me to have the collection published. And to my fellow students and dedicated fellow writers who walked with me, especially to Mark Riboldi and Mark Rossiter for their invaluable feedback on many of the stories. My gratitude to Mark Tredinnick, for his poetic inspiration, and for introducing me to a wide range of reading and writing. A special thanks to Clint Caward and Ross Duncan, for their advocacy of my work through their own associates and networks. I am infinitely grateful to Caroline Wood, my publisher from Margaret River Press, for saving the collection from the tragic fate of the bottom drawer. I also wish to thank her superbly competent team, particularly, Amanda Curtin, for her caring and meticulous editing; and Brendan Fredericks, for his energetic and dextrous ushering of A Chinese Affair into the public sphere. If I’ve left anyone off the list, I promise your name is carried in my heart. To gather my thoughts for the launch speech, I wrote down the title ‘The Genesis of an Affair’. And since it’s a Chinese affair, I need to trace back to my life in China, and as it’s my first book, I need to start from the very beginning, because everything before the book is its backstory, the story of how I was shaped by storytelling. Before my own memories formed, I have to rely on the diary my mother kept from my birth till I was almost two. It stopped on the day when she was sent away to Inner Mongolia, and we were separated for the first time. In those early years, it seemed everyone in my family was telling me stories. I loved those books. My mother wrote fondly how I sat in the crib, reading my brother’s textbook upside down. I was even able to pick out his English textbook among all the others. I started to remember things from the age of three. From memory my mother only had two stories. She wasn’t apt at storytelling, but she taught me drama and imagination. To get to the kindergarten, she had to push my stroller over the Tibetan Plateau, and down the Turpan Depression. Every morning we traversed the globe, our journey adventurous and rich with incident. My father was the master storyteller. Night after night, he told us episodic stories he had made up, of the animals in an enchanted forest. I soon started to make up my own stories. My mother once saw me sitting in the teacher’s chair, telling a story to my kindergarten class. She was so proud. When I was five, I contracted tuberculosis. For six months, I couldn’t get out of bed. To keep me entertained, my mother read me books, at first children’s stories, then adult novels, mostly about communist revolutions and class conflict. My memory of this period was nothing of the illness, but pure joy in having her full attention and being read to. But I was growing weaker. 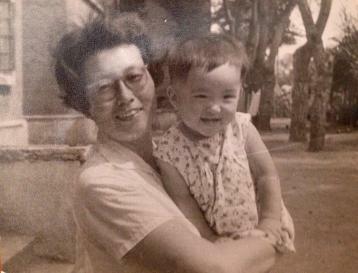 One evening I had such high fever, my mother thought I was going to die. She sat next to me in bed, watching me, weeping. I was too young to empathise with her sorrow, and was only mildly annoyed that the reading had stopped. I urged her to carry on reading. So she did, with tears trickling down her face. What I had wanted when I was closest to death was to be told a good story, to be read to by my loved one. Thank you for listening to my stories of storytelling, the genesis of an affair, although what I say doesn’t really matter anymore. When a book is published, it no longer belongs to the author, but to the reader. It’s now yours. I wish you happy reading. Thank you.